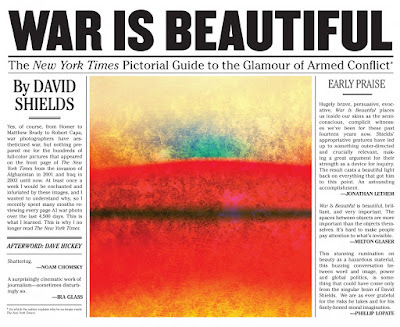 David Shields' "War is Beautiful" is an evocative, coffee-table-worthy critique of an art form that seems increasingly irrelevant to how popular impressions and opinions are generated today. In an Age of "We Can Haz" Cat Memes and Pick-Your-Spin TV news, does the front page, above-the-fold photographic paper-space of The New York Times still represent anything like the key terrain for the hearts and minds of John and Joan Q. Public? Probably not. But to over-focus on the deflating state of old media, in this case, would be to miss a larger tableau. In journalism schools and practice, at least in the reviewer's admittedly 20 century experience, the oft-stated goal is to teach people "not what to think, but how to think." 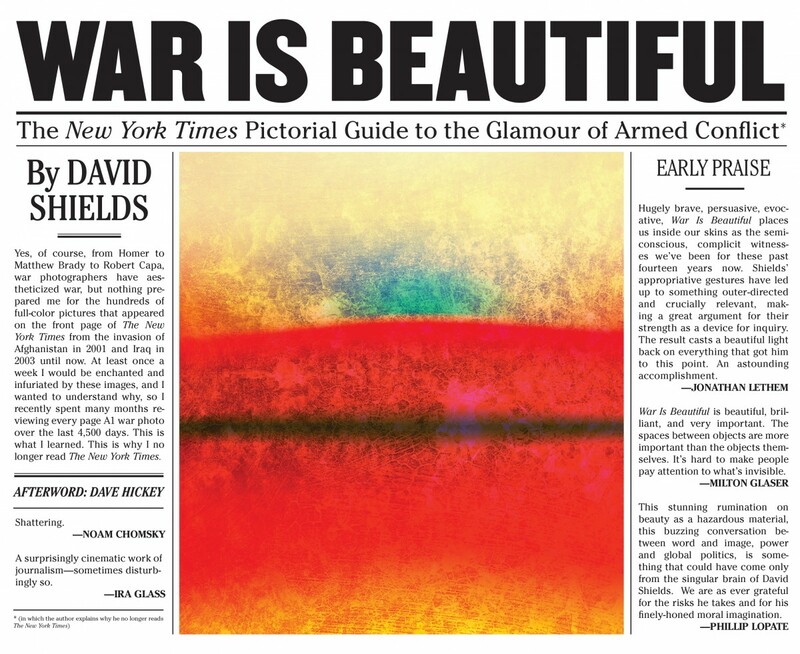 Framing his explorations in an extremely tight shot—here, the example of one still-influential newspaper's hardcopy coverage—Shields is out to teach people how to think about journalism, and how images of war are developed and fixed, even in our digital age. Armed with knowledge of these themes, any reader of "War is Beautiful" will walk away with a new tool in their media-analysis kits. Shields' system of classification is, after all, potentially applicable to other mediated sources of war images. That includes those generated by governmental and military public affairs, as well as civilian media embedded with governmental agencies. In the latter, independent journalists are still dependent on their U.S. agency hosts for access, security, transportation, and food, potentially skewing views and access to events, places, and sources. Shields locates responsibility for the Times' distortions of reality to the newspaper's historically chummy relationship to governmental power. "Throughout its history, the Times has produced exemplary war journalism, but it has done so by retaining a reciprocal relationship with the administration in power […]," he writes. "[I]t knows precisely what truth the power wants told and then prints this truth as the first draft of history." Newspaper photographs have always had a job to do, but combat photographs today are so profoundly touched in the process of bringing them out, that they amount to corporate folk art. […] The exoticism of war and the Middle East has been suppressed almost completely on the American premise that anywhere an American hangs his hat is home. This whole book, in fact, could have been photographed in California and Nevada. […] The total effect of these photographs is to portray an American industrial project in a desert somewhere with swimming pools, basketball, and baseball being played. Lunch is being served. The commander and chief is giving his soldiers noogies. There is some fire, of course, but we love fire. There are echoes of the elaborate German films and photographs that created a fantasy world of the Russian front where millions were dying. Summing it up, these pictures generate more distrust of American military adventures than I had before, and I had a lot. While I might enjoy jousting with Hickey over his characterization of "war photography" as "combat photography"—personally, I would limit the latter term to describe images of actual weaponized conflict—I agree with his conclusions. I agree that most images of war that I encounter as a consumer of news, on-line and in print, present a world comfortably at war. That's mostly because the American way of war has become banal and boring and repetitive. Long in the tooth, as well as the tail. We export American suburbs as Forward Operating Bases ("FOB"), and staff them with endless rotations of soldiers and contractors. The "Long War" seems ... endless. Having once been a small-town newspaper editor, I can tell you that coming up with artful new ways to present the same schedule of events—fun runs, weather and fire pictures, county fairs, funerals, restaurant openings—is a challenge. In size, scope and function, a FOB is analogous to a small town. In a current side project (www.fobhaiku.com), I am myself curating "small town" photography generated by military public affairs photographers, with the intention of subverting it toward what I hope are poetic, humorous, and socially constructive purposes. Shields and Hickey go beyond such passive-aggressive snark, of course, and directly attack the images, along with their implications. The Home-Sweet-FOB picture show is a reality, but not the only reality. Another reality is that war is a meat-grinder. Today's news consumers are buying the tasty sausage, without having to visit the butcher shop.